Allison Shire, a former academic, is now a tour guide for all things Lord of the Rings by J.R.R. Tolkien. She has sworn off love. Then Jackson Gregory steps into her life. He’s on the three week tour with his great-uncle, though he knows next to nothing about Lord of the Rings. He, too, has no interest in love and romance. So, what happens when the sparks ignite between these two? Lots of mishaps and misadventures. I really enjoyed this quick, easy read. 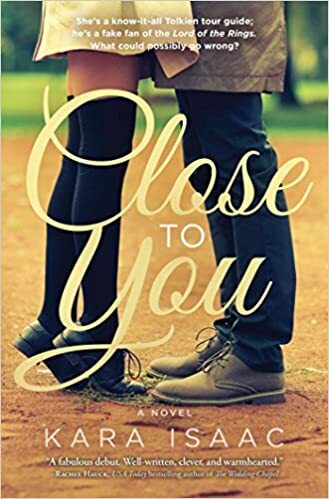 it’s a really sweet, cute romance story that made me laugh and brought a tear or two to my eye. It was tons of fun with all of the references to Lord of the Rings. Kara Isaac does an excellent job of writing witty dialogue and original descriptions. I will remember Jackson and Allison for a long time, and I may have to give this another read when I need something light and fun to read. If you enjoy sweet romance stories or are a Lord of the Rings fan, you may find yourself as drawn into the story as I was. One night, I just couldn’t put this book down and I read past my bedtime. I finished the book the very next night, completed in just one week (I only have time to read for about three hours six nights a week). This is Kara Isaac’s debut novel and I enjoyed it so much that I can’t wait to read her newer novel, Can’t Help Falling, released just six months after this one. Can’t Help Falling includes references to The Chronicles of Narnia by C.S. Lewis, which are near and dear to my heart.